“The Prep List” that all cruisers have. Our list grows on some days, two person vs one person projects, costly vs cheaply, it becomes overwhelming. So we take the pencil to it, scratching off the maybes, niceties, and wannas, and associated costs; leaving those as “oh well”. We took other cruisers’ advice. But honestly, there are some things that make the boat cruise ready that can’t be scratched off. Our list will eat up four months, not everyday working, some design, paint drying, waiting for parts and vendors. We will have one month left over to rub our faces and wonder if there is room to spare on the boat. We had two very old Seimens 50 watt panels that have discolored and diminished cells. Between the power hungry refrigerator, AIS – chartplotter, SSB, laptop, and other electronic gear we completed a usage calculation and decided 300 watts would be ideal. John did a lot of research, focusing on panel size, wattage, weight and mounts, and of course – cost. 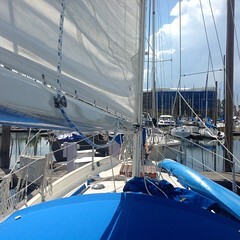 We settled on the Renogy marine 100 watt panels and a Blue Sky MPPT controller. We’re still working on mounts. Two will go on the aft SS lifelines and one probably on the dodger that is portable. 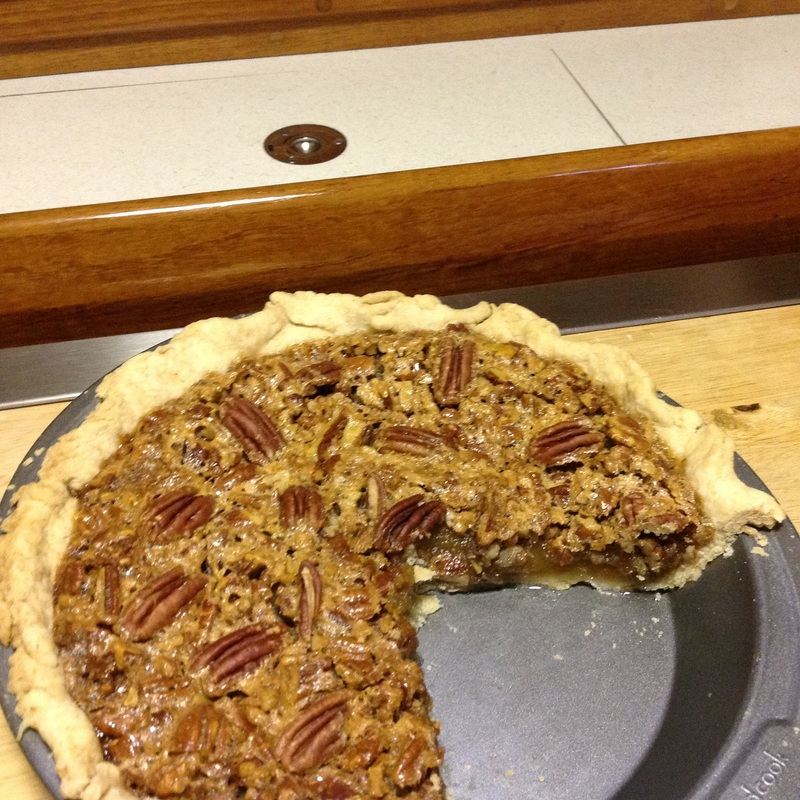 This is the Pecan pie job. The dodger is tired and torn in a few places, rotted in the PNW cold rain. Patches, new zippers, re-sewn seams won’t hold up any longer. We’ve seen some very nice dodgers on Westsails. 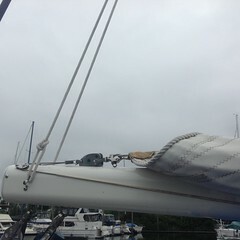 To name a few, Worldwind has a sturdy hard dodger that they made from fiberglass; Elizabeth Ann has a sweet light blue sunbrella dodger fashioned after Saraband’s frame, inset from the side of the cabin about 5″ on both sides to allow a step area on top to reach the boom. Albion WS43 has a stunning, custom wood dodger, George said he spent the last of his life’s savings on it, LOL. Our dodger frame had to be redesigned. We too narrowed the frame, and made an allowance for more room between the dodger and mast for the folded 8′ dinghy. The design brings the front of the dodger back towards the hatch by 7″, raising the forward frame and strata glass by 2″. This allows short people like myself to see more than just the back of the windlass. 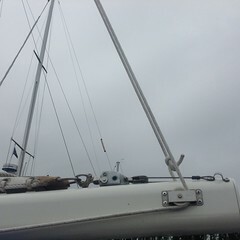 I will be able to see beyond the bowsprit and actually view the waterline. I’m so elated to be able to stand in the cockpit and steer, it will much drier and safer than standing up on the stern deck with my arm and hand wrapped around the boom gallow stanchions while gripping the tiller with the other. We opted to upgrade from strata glass (vinyl) to Makrolon, polycarbonate. It’s very hard, looks like glass and is U.V. resistant. But over time, nothing is totally resistant and it will yellow, so covers are important. Add another item to the sewing list. No Pie for John. Just keep baking pies and John will work really fast. My independent projects are smaller but having 110v is motivation to get those done soon. Stay tuned for the next pie, sounds sweeter doesn’t it? The Boat Show – Good deals? We went to the Portland Boat Show searching for some good deals on boat gear. 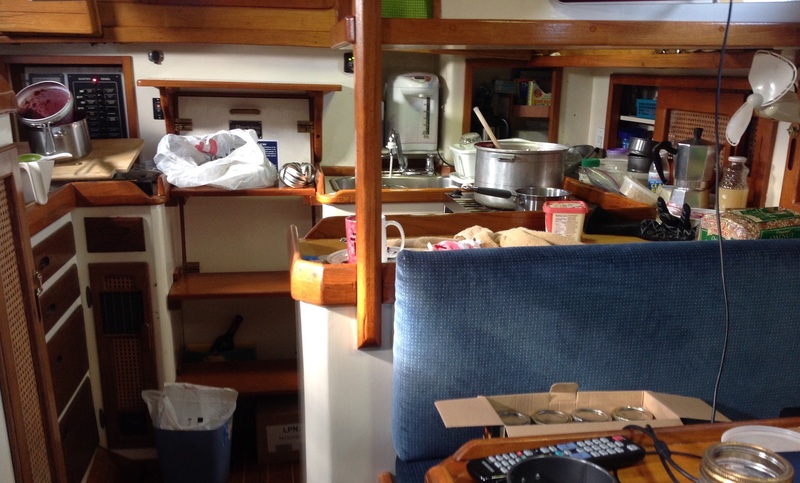 Well most boat owners don’t have the luxury of “out of the box” fit. Neither do we and I want instant gratification when I bring my haul home and drag it down into the cabin. Picture new shoes. The fish finder/depth sounder corroded away last summer. We searched the internet for something that would just be a replacement. Nope, need new wiring pulled through, the cockpit mount isn’t the same, glass and paint work required? The expensive option isn’t ours: include it in the Garmin chart plotter, put in a thru hull and mount it. We just covered all the thru hulls in the rudder fairing project to have a smooth bottom. Work and expense of that option isn’t happening. 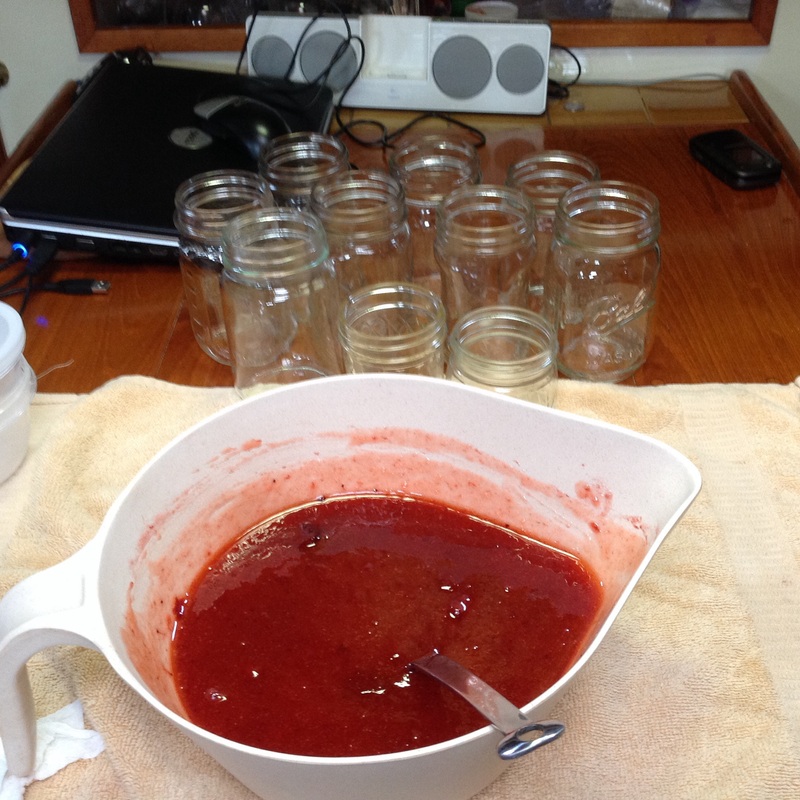 Back to cheap version and labor, keep the project on the “to do list”. Bummer. Konami didn’t come with storm sails, kinda naked. 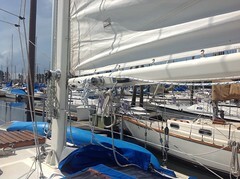 We will want both Storm Jib and Trysail when we are doing the shake, rattle and roll on the ocean. We got quotes from three different sail makers. Why can’t we have consistent pricing on the sails. Either the sail is too big requiring a custom fit, cheaper price for one or the other, all orange or orange corners, off the shelf pricing but not what we want. I just want two storm sails with matching stylish sail makers’ emblems. 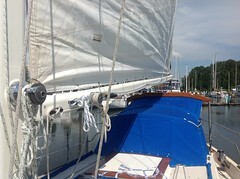 The sail makers themselves became so confused with sail dimensions, numbers, pricing and colors they have me confused. We’re all scratching our heads. We’ve been promised to receive boat show pricing even if we don’t order now so we can do more research on which dimensions are best for Konami. Back to the notebook. Didn’t find a second “car” dinghy. Most everybody says a second unit is great to have. They can be stolen, float away or punctured on the sharp coral. It also provides freedom for the crew. We’re thinking about a tandem kayak. A few drawbacks though. Doesn’t track well in current (been there), may get swamped in windy, choppy conditions, a bit pricey for a good one, about the same price for a small hypalon “rowabout” dinghy. The hot sun is very hard on plastic things. But would be nice for paddling around in a lagoon on a quiet day. Didn’t see anything that was worth shelling out money for. Keep looking. E-Charts for the Garmin: we calculated about $1000 for all the areas we want to cover. Pricey, but a very nice to have, after all that’s why we bought it. May keep us from hitting a reef, eaten by sharks and setting off the alarm. There are used chips/cards on the market but hard to find the exact one are you’re looking for. Some boot-legged stuff perhaps but I wouldn’t trust my life on it. What Garmin doesn’t advertise is a good deal for the users. If you call and work with the Garmin Cartography department, they will custom build a chart program for the desired locations and is 1/3 the cost of individual chips. And one other bit of info, the user can send in a used card and get a new area in exchange plus a little bit of cash. The last I checked it was about $50 for a new area. A lot better than $160 – $320 for new chips. , Make that call next week. Woot. Final looksy: the EPRIB. Got a decent deal on the McMurdo, with the new and improved GPS smart finder. Warranty is fine, no problem. Guarantee we’d be located if we had to use it? Blank stare, pay up the life insurance to help those grandchildren. If you have any good deals, please throw me a bone. I have updated some of Konami’s pages, including the safety equipment. Happy New Year and a very warm, Thank You. Bowing deeply to your elders, relatives and close friends, the Japanese New Year tradition begins with a customary saying. Some of the words cannot be directly be translated word for word, it is a heart felt translation. “Congratulations! The New Year has begun. Thank you for all you did for me in the past year, please treat me favorably again this year, I am indebted to you.” Akemashite, omedeto gozimasu. Saku nen wa, iroiro osewa sama deshita. Kotoshi mo, dozo yoroshiku onegai shimasu. Then we eat traditional foods that have symbolic meanings. Pounded sweet rice (Life) Lotus root (see the future) , fish eggs (family) , boiled root vegetables, sweet black beans (work hard and good fortune), pickled vegetables ( health) , rolled seaweed (happiness). We share the meal then move to the next home to make the same greeting and eat more. This is done for three days until you have formally greeted everybody that deserves respect, commands humbleness on our part, and share the enjoyment of eating together and giving thanks. The recent Paris terrorism aftermath put a damper on the new year. It has left me very sad about the world and wonder if we really are thankful for every morning, even if we feel not so peaceful, have dull routines, and experience minute annoyances. I certainly do my share of complaining and I don’t always express heartfelt thanks. Thank you, thanks, thanks much, thank you from the bottom of my heart, thx, ya thanks. It has a very off hand sound, doesn’t it? We say our thanks for everything we receive, own, share, clean air, prayer, but nothing really brings those blase’ expressions closer to the conscious thought with meaning like tragedy and oppression in the world can. I am deeply concerned by the inhumane acts of terrorism and cruel people. I think of the tragedy, bloodshed, and ponder mankind’s future existence. We are thankful that our sister is safe in Paris, as she was about a 1/4 kilometer away from the Charlie Hebdo headquarters. Pray, meditate, legislate, rally for more peace in the world! Live each moment with sincerity and kindness to all. Thank You!